Do You Know that you can search just the 700 pages of Clippings and Scrapbooks on the site by using the Clippings button in the Partitioned search engine on the Current What's New Page? You'll also find obituary and other newspaper clippings using the three county-level Obits by Cemetery buttons. Additional clippings can be found in the Birth, Marriage, and some other partitions. Lambs Creek articles from the 1899, 1900, 1901 and the 1902 Republican Advocate - Wellsboro, PA. by Miss Ella Rankin. Lambs Creek articles from 1904 The Mansfield Advocate, Mansfield PA, by Miss Ella Rankin. Lambs Creek articles from 1900, 1901 and 1902 The Mansfield Advertiser, Mansfield PA, by Miss Ella Rankin. Charles Watrous and wife, of Watrous, are guest of A. P. Brewster this week. The Marriage of W. G. Seamen and Miss Jennie B. Day, daughter of Wilson Day, of upper Lambs Creek, which took place last March has just been announced. Charles White, of Elkland, has purchased the G. A. Lamb Farm of 45 acres for the sum of $1,500. Mr. and Mrs. Henry Glenright, of Morris Run, are rejoicing over the birth of a daughter. Mrs. Glenright was formally Miss Lena Cooper. The marriage of Miss Gertrude Woitwich, of Mansfield, foamily of Pickle Hill, to George Kettyle, of Corning, N.Y., took place in Elmira last week. John P. Griffin, of upper Lambs Creek and Miss Nellie White, of Mansfield, were recently married. Many friends tender hearty congratulations. Mrs. Henry Glenwright, of Pickle Hill, is reported dangerously ill.
Mrs. S. L. Hotchkiss is on the sick list. At a recent re-organization of our Sunday-school the following were elected: Edward Fuller, supt. ; Mrs. Laura Warters, librarian and secretary; J. L. Moore, treasurer, and Miss Ida Ranken, organist. Herbert Rice and his wife were called to Cherry Flats, Thursday to attend the funeral of Elisha Zimmer, Mrs. Rice’s cousin. W. E. Peck is very sick with pneumonia. George Mattenson, who has been quite ill, is somewhat better. Frank Van Dusen, of Farmington, was in town Friday. The little child of Edward dorsett is improving. Dee Warters died Friday evening, of consumption, at the home of his brother, Thomas Warters, in Mansfield. Deceased was a former resident of this place. Elmer Peck of Elmira, has been home for a few days. Joseph Oyer started last week for Herbron, III, where he has secured employment. Walter Cruttenden, of Wilkes-Barre, formerly of upper Lambs Creek, was married last Wednesday to Miss Sadie Ripley. Both young people are highly esteemed and have hosts of friends who extend a hearty congratulations. Mrs. Isaac VanDyne is on the sick list. W. E. Peck is slowly recovering from his recent illness. News has been received here to the effect that Mrs. Louise Cochran is dangerously sick with Typhoid fever at her home in Hornellsville, N.Y.
L. B. Knowlton has moved to his farm in Charleston. Chauncey Brewster, of Campbell N.Y., is visiting his brother, A. P. Brewster here. Miss Nettie Jenkins has returned to Romulus, N.Y.
Miss Prudence Colegrove closed a very successful term of school at Upper Lambs Creek on the 4th inst. The entertainment given in the evening was very good. Mrs. Elmer E. Peck, of Elmira, recently visited her sister, Mrs J. P. Griffin. Prof, N. C. Giles was home form VanEtten, N.Y., for a few days last week. Miss Addie VanDyne is very sick. Our school, which has been successfully taught by John Shaw, closed last Thursday. The entertainment given in the evening was very enjoyable. A. Lamb is confined to his house due to illness. Thu VanNess, of Mansfield, is to open a general store building lately vacated by L. B. Knowlton. Mr Knowlton, who ran a grocery store here, has moved to his farm in Charleston, but will run a grocery wagon through here weekly. Last Tuesday evening a sociable was given at the residence of Edward Fuller for the benefit of the pastor, Rev L. D. Adams. L. K. Guile has his cellar completed and is ready to commence putting up his house. M. F. Randolph, of Horseheads, N.Y. was in town Yesterday. E. P. Shaw has returned from Peale, where he has been teaching school. Rev. L. M. Gates, of Mansfield, will preach here next Friday evening. Miss Lucy Brace, daughter of Mrs. Hilton Brace, of Mansfield, was married last Saturday evening to Oscar Clark, of this place. Rev. W. G. Hull, pastor of the Methodist Episcopal Church, tied the nuptial knot. Both have many friends in this place who extend their congratulations. David Persing, of Gaines, and Miss Cora Hakes, of Upper Lambs Creek, were married in Lindley, N.Y., on the third instant. Mr. And Mrs. Persing will be living in Gaines. W. McNulty, representing the Wellsboro Agitator, was in town Friday. Mr. And Mrs. Abner Jenkins are visiting friends in Gaines. Mr. And Mrs. Archie Hotchkiss, of Watkins, N.Y., are visiting relivitves here. Mr. Ellery Lamb, of Corning, was in town last Wednesday. Born, to Mr. And Mrs. Alonzo Waters, of Upper Lambs Creek, a son. Fred Lamb was badly injured in a runaway accident at Mansfield the other day. Mr. Alfred Warters recently moved to Gaines, where he has secured permanent employment. George R. Fuller left here last week for Watrous where he has secured employment. W. G. Seamen, recently moved to Gaines, where he has secured work in the Watrous Mill. E.P. Shaw has been engaged to teach our district school. Fred Lamb has improved the appearance of his house by having it painted. J. N. Paris and P. Griffin have each lost a good horse. Mrs. L. B. Knowlington has gone to West Virginia to spend the summer with her brother, Herman Nash. The first annual re-union of the Lambs Creek school with be held in this place on Saturday, June 30. Dinner will be furnished by the members of the Methodist Church. A pleasant time is anticipated. William Sweet and his wife, of Corning, were visiting relatives here. Miss Lucy Peck, who has spent nearly a year in Elmira, is visiting her parents here. Mrs. H. Pittsey and son, of Elmira N.Y., are visiting at the home of J.L. Moore. George Ripley has secured a position as a conductor on the electric street line car in St. Louis, MO. Mrs. C.O. Loveless, of Tioga, visited friends in town recently. Miss Alta Peck has been visiting her sister, Miss Lucy Peck, at Elmira. Mrs. Ira W. Kelly is visiting friends in Wayne County. H. P. Phelps, of Elkland, is visiting his daughter, Mrs. Isaac VanDynn. Mr. And Mrs. John Button, of Upper Lambs Creek, are rejoicing over the arrival of a daughter. Mrs. Walter Cruttenden. Of Wilkes-Barre, is visiting her parents, Mr. And Mrs. W.B. Ripley. Mrs. C.B. Lamb and her sone Earl, of Corning, are visiting friends in town. Mrs. Anna Fuller is visiting in Watkins. Mrs. Frank Lamb and her daughter Grace, of Corning, are visiting relivitves here. Herbert Rice left here of Watrous last Tuesday. He expects to obtain employment there. Miss Celia VanNess, of Mansfield, has been spending a few days with Harry Loveless and Family. 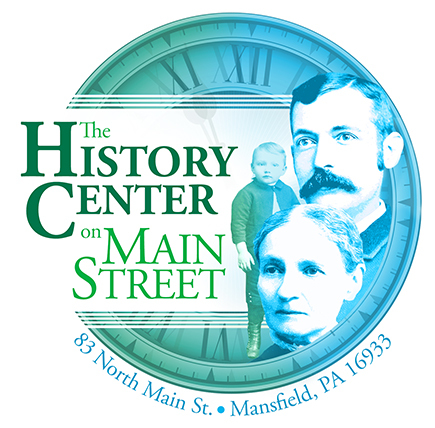 The telephone line connecting Mansfield and Upper Lambs Creek was completed last week and phones have been set up in the homes of Edward Dorsett, Wilson Day, Reuben Warters, Henry Warters, C. S. Ross and J. W. Adams and in Thu VanNess’s Store. Mrs. M. J. Barnes is spending a few days with friends in Gaines. Mr. And Mrs. Howard Kelley, of Corning, have been recently visiting friends in town. Rattlesnakes are numerous in this region this year. Mrs. Bert Whitney and her daughter, of Caton Centre, N.Y., spent Tuesday with friends here. Mrs. Whitney was formerly Miss Maud Taylor. Mrs. Susan Sours, of Upper lambs Creek, is improving from the effect of injury she received a few days ago. Miss Bertha Knights, of Elmira has been visiting friends here. Miss Edna Day, of Corning, N.Y., has been engaged to teach our district school. The reunion of Company C, 7th Pennsylvania Volunteer Cavalry, will be held at the home of J.L. Moore, on Thursday September 6. Miss Nettie Jenkins, of Romulus, N.Y., is visiting her parents here. E.P. Shaw returned last week from Corning. Miss Rena Ripley is visiting friends in Elmira. Mrs. Christine Bell, Of Elmira, accompanied by her son, William Bell, of Brooklyn, N.Y., were guest last week of Mrs. Bell’s sister-in-law, Mrs. S.D. Brewster. M.H. Fralic, of Corning, was in town on Wednesday. A son was born on the 13th inst. To Mr. And Mrs. Claude Sours. The Bloss Oil Company, have their derrick completed and will begin drilling this week on their location near here. This location is on the Fralic’s Flat on the west side of the Tioga river near the cove. The annual reunion of Company C, 7th Pa. Cav., at J.L. Moore’s on the 6th inst. Was attended by one hundred persons, including twenty-three surviving members of the company. A large tent had been pitched to accommodate the crowd. The occasion was enjoyed by all present. W.B. Lamb, of Corning, was in town last Tuesday. Henry Paris is recovering from typhoid fever. Mrs. Walton lamb and Mrs. Charles Lamb, of Corning, N.Y., visited friends in this place. Louis Benson, of Watkins, N.Y., and miss Edith Harvey, of Upper lambs Creek, were married recently. The Bloss Oil Company’s well on the Fralic lease was completed last week. It drilled to a depth of 1,195 feet. A little gas was found, but no oil. Elmer E. Warters and wife, of Upper Lambs Creek, rejoice over a son. J. M. Rice has moved to Galeton. Walter, eldest son of the E. L. Forest, of Upper lambs Creek, is confined to his home with the mumps. Ira Hakes is reported very sick at his home at upper Lambs Creek. Mrs. S.D. Brewster, who has been very sick with typhoid fever, is improving. C. Clark returned home from Galeton last Tuesday. Mrs. Frank Orcutt, of Lawrenceville, with her two children, is visiting her mother, Mrs Albert Sherwood. Mrs Delbert Paris, of Upper Lambs Creek, died on Wednesday, Nov. 7. The remains were taken to Tioga for burial. Mrs Mary Wood has returned from a visit in Nelson. Mrs .M. J. Barnes is confined to the house by illness. Philo Bellinger has moved his family to Mansfield. Clarence J. Moore, of Scranton, is seriously ill. Many friends hope for his speedy recovery. P. F. Ripley with his family returned to Trenton, N.J. on Tuesday, after spending a few days with his parents here. Ada M. Johnson has gone to Galeton. Ira Hakes, of Upper Lambs Creek, is very sick and little hope is entertained of his recovery. News has been received her to the effect that Archie Hotchkiss is very sick at his home in Watkins. Mrs. G. E. Clark gave birth to a son on the 6th inst, and Elmer E. Peck and his wife, of Mansfield, are rejoicing at the birth of a daughter. The general hunt of Lambs Creek sportsmen, with Reuben Warters and George Fuller as captains, took place as scheduled. In connection with the affair an oyster supper was given at the home of Wilson Day, the losers paying for the suppers of those on the winning side. Over 100 persons were present. A pleasant time was reported. The many friends of C.J. Moore, formerly of this place, now of Scranton, will be glad to know that he is recovering from his severe sickness. Thu VanNess was in Elmira on business last Wednesday. M.H. Fralic, of Corning, spent a few days in town last week. Mrs. A Jenkins is in Gaines, having been called there by the dangerous sickness of her sister. Mrs. W.F. Lamb returned from VanEtten, N.Y., last Tuesday. P. N. Tuttle attended the funeral of Giles Fleming, in Tioga, Jan.8. The largely attended funeral of Afton Hagar, who was killed by the cars in Mansfield on the evening of the first inst., was held from the Methodist Church here Friday afternoon, Rev. W.G. Hull conducting the services. Mr. Hagar was a former resident of this place. Clarence J. Moore, of Scranton, is visiting his parents, Mr. And Mrs. J.L. Moore. Mrs. H.S. Warters is improving. Mrs. Frank Blanchard, of Covington, has been visiting her sister, Mrs. J. C. Jenkins, for a few days. Mrs. C.F. White has returned to her home in Elkand. Mr. And Mrs. Archie Hotchkiss, of Watkins, N.Y., are visiting relatives here. Mrs. W. H. Kelley is recovering from an attack of quinsy. Mrs. Thankful Bailey, of Minnesota, is visiting at W. E. Peck’s. Miss Mary Clark is visiting relatives at Van Etten, N.Y.
Wilson Day had business in Elmira, N.Y. last Friday. Prof. And Mrs. N.C. Gile, of VanEtten, N.Y. are rejoicing over the birth of a daughter. Mr. And Mrs. G. R. Fuller visited in Morris Run last week. B. Faulkner of Mansfield, died last week Monday of pneumonia. Mr Faulkner formerly resided at Pickle Hill and was well known here. W.C. Moore, of Charleston, is visiting friends and relatives here. A social was given at the residence of Isaac vanDyne Thursday evening, for the benefit of Rev. L. M. Gates. It was a success, the proceeds being over $20. Alex Buck and wife of Lindley, visited friends her last week. H.P. Phelps, of Elkland, is visiting his daughter, Mrs. Isaac VanDyne. M.H. Fralic of Corning, was here last Wednesday. Mrs. A.M. Fuller, of Morris Run, is visiting relatives here last Wednesday. Mrs. M. J. Barnes is continued to her bed with grip. Mr. And Mrs. W.L. Cruttenden of Mansfield, are rejoicing over the birth of a son, who arrived on the 17th of January. Mr. And Mrs. A. S. Hotchkiss, of Watkins, returned to their home last Wednesday after visiting relatives in this place for some time. M. H. Fralic of Corning, was here last week. Mrs. W. J. Cruttenden is convalescent. J. C. Beach, of Sabinsville, was in town last week. Mrs. Charley Cruttenden was called to Elbridge last week on account of the illness of her mother, Mrs. B.D. Rice. Harry Loveless and family have removed to Tioga. Mr. And Mrs. E. L. Fuller are visiting relatives in Corning. G.A. Lamb, who was alarmingly ill last week, is considered a little better. The social at N.A. Willard’s last Wednesday evening netted Rev. W. G. Hull $20.50. The marriage of Wilson Day and Mrs. Lydia M. Shaw, both of this place, is announced. Charles A. Day and wife, of Graceton, Indianna County, rejoice over the birth of a son. S.L. Hotchkiss is confined to the house by illness. W. J. Ingalls, of Upper Lambs Creek, is on the sick list. P. N. Tuttle’s granary was burned Friday afternoon with a quantity of grain and tools. Loss about $200. Miss Ida Fuller, of Morris Run, spent Sunday here as the guest of her nephew, E. L. Fuller. Fred Day was home from Elmira, N.Y. over Sunday. Mrs. I. M. VanDyne gave a party last Monday evening for a lot of little folks in honor of the eighth birthday of her son Delbert. Mr. And Mrs. Edward fuller returned home from Corning last Wednesday. G.D. Fralic of Corning, formerly of this place, is attending college in New York. W. E. Peck has lost a good cow. Frank Sherwood of Utica, N.Y., has been visiting relatives here. Rev. D. L. Pitts of Hamondsport, N. Y. Passed through this place Friday on his way to Campbell. Gad. A. Lamb, aged 81, a highly respected and life long resident of this place, died of paralysis lat Thursday afternoon at the home of his sister, Miss Maria Lamb. He had been in poor health for sometime and about four weeks prior to his death he was stricken with paralysis. Mr Lamb married in 1852 Miss hannah Cooper, who died in 1884. He was the father of six children, four of whom, with an adopted daughter, Mrs. H. Glenwright of Morris Run, survive him. They are Mrs. William Downing of Binghamton N.Y.; Mrs. Ada Barnard of North Dakota; Arthur Lamb of Bath, N.Y., and Ross Lamb of Hancock, Wisc. He is survived by three sisters and two brothers, Mrs. Lewis Carpenter of Farmington; Mrs. C. C. Cook, Miss T. Maria Lamb, Bradley and Frederick, all of this place. Funeral services, conducted by Rev. L. M. Gates, were held Sunday afternoon from the Methodist Church, of which Mr. Lamb was a member. Arthur Edwards, of Elkland, was in town last week. L.C. Lamb had business in Elmira last Tuesday. Mrs. Eugene Day, who has been sick the past week, is improving. J. W. Adams finished sorting his tobacco last week. Rev. W. G. Hull announced from the pulpit Sunday that he would begin revival service here next week. Miss Maria Lamb, of this place, is spending a fortnight among relatives in Corning. Mrs. Mary Knowlton is ill with grip. Frank Barnes left here Wednesday for trout Run, Lycoming County. Mrs. C. E. Brewster and her son, of Lowman, N. Y., are guests of L. K. Gile. The Ladies Aid Society met at Mrs. S.L. Hotchkiss last Thursday. The next meeting is to be at Mrs. George Allis. Miss Lucy Peck has returned to Elmira. J.L. Moore is confined to the house by illness. Colon Clark is home from Galeton. About 45 friends of Miss Grace Oldroyd gave her a pleasant surprise last Friday evening, her twenty-first birthday. A son has been born to J. P. Griffin and wife. Rev. W. G. Hull began a series of revival meetings on Monday night. He will be assisted by Rev. W. H. Yard, of Mainesburg. Delbert Allis is visiting friends in Troy. About 30 friends of Mrs. J. C. Jenkins gave her a pleasant surprise Tuesday evening. C. F. White, of Elkland, is visiting relatives here. Mrs. Claudia Hakes has returned from North Bingham, Potter County, where she had been teaching school. Mrs. Fred Mourey, of Elmira, is the guest of Mrs. U. E. Peck. Master Lynn Knowlton has been very sick with grip. The sociable at W. H. Clark’s last Friday evening, netted Rev. W. G. Hull about $25. Eugene Day has moved into the Millard Hotchkiss house. Reuben Warters and Mrs Wilson Day are on the sick list. Rev. W.G. Hull received twenty four persons n the Methodist Church Sunday afternoon. M.H. Fralic, of Corning, is in town. L.C. Lamb has gone to Corning. Mrs. Nettie Day, of Knoxville, formerly of this place, is visiting friends here. Mrs. S.L. Hotchkiss has nearly recovered from her late illness. Harry Sawyer, of Michigan, visited at P. N. Tuttle ‘s last week. Mr. And Mrs. C. J. Ripley visited friends in Charleston recently. Miss Louise Kelley is improving. J. C. Jenkins has moved into the George Allis house. E. E. Warters, of Lambs Creek, has the contract for peeling 1,000 cords of bark for H.M. Fralic this summer. Day and Warters, at Lambs Creek have a job of sawing 200,00 feet of logs for Charles S. Ross. Miss Elizabeth Thomas, of Crooked Creek is the guest of her cousin, Miss Alta Peck. The ladies’ aid society of the Methodist Church will serve ice cream and cake on the church lawn the afternoon and evening of the fourth. Harry B. Fralic, of Corning, N. Y., formerly of this place, was graduated last week from the Mansfield Normal School. He will enter the Medico-Chirurgical College in Philadelphia this fall. David Persing, of Gaines, is reported dangerously sick with typhoid fever. Miss Margaret Amish, of Spencerport, N. Y., is the guest of Mrs. Willis Hakes. Adelbert Allis has accepted employment in the Willard State Hospital. Rev. W. B. Armington, of Ohio, formerly of Covington, gave an interesting discourse in the school house last Sunday evening. 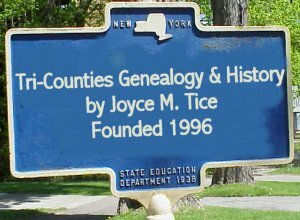 Recent visitors here were Mrs. William Mengee, of Wellsboro; Mrs. Edward Day and son, Harold, of Stokesdale; Mr Wakely, of Austinburg, and William Sweet and wife and Clarence S. Moore, of Corning. Miss Claudia Hakes, of Upper Lambs Creek, and Norman Fuller, of Hoytville, were married last Wednesday evening at the home of the bride’s brother. Willis Hakes. The ceremony, which was witnessed by only immediate relatives of the principals, was performed by Rev. W. G. Hull, of Mansfield. The bride is a graduate of the Mansfield Normal school and for several years has been a successful teacher. She has many friends here who wish her the greatest happiness. Mr and Mrs. Fuller were the recipients of many beautiful presents. They will reside in Hoytville. Prof. N. C. Gile has returned here with his family from VanEtten, N. Y., to spend the summer. He has been re-elected principal of the VanEtten school at an increased salary. Alic Buck and wife of Lindley, N. Y., were Sunday guests of Mrs Jennie Day. The ladies’ aid society, of the Methodist Church, held an ice cream social on the Fourth and cleared about $20 for the benefit of Rev. W. G. Hull. In th evening there was an entertainment. There was also a short address by the Rev. W. G. Hull and the house was crowded. Fireworks and ice cream were then served in order, bringing the festivities to an agreeable close. Miss Minda Wakely, of Austinburg, is the guest of her aunt, Mrs. S. D. Brewster. Lambs Creek - August 9 Mrs. J. L. Moore has been visiting in Corning and Elmira. Mrs W. A. White and son are visiting relatives in Lindley. Whooping Cough is quite prevalent here now. Messrs B. F. Shaw and E. P Shaw are visiting in Austinburg and Andover N.Y.
S. L Hotchkiss had business in Tioga last Wednesday. Mrs. W. L. Cruttenden and her son, of Mansfield, visited in town the first of the week. The annual reunion of Company K, 210th Pa. Vols, will be held on September 24th, at the house of Volney Ripley, near Mansfield..
Mrs. D. L. Foster, of Rutland, is the guest of her parents, Mr. And Mrs. P. N. Tuttle. William R. Irvin, of Williamsport, delivered a very good temperance lecture in he Methodist Church Thursday evening. Miss Nellie Kerwan, of Elmira, is visiting her sister, Mrs. W. H. Kelley. Boyd McConahy and Miss M. Jenkins, both of Willard State Hospital, were married in Watkins, N.Y., on July 28th. Rev. W. H. Lattimer, of the Methodist Church, officiated. The groom is a popular young man of Willard, and he is a very talented musician. The bride is the daughter of Mr. And Mrs. Abner Jenkins, of this place, and she has the heartiest congratulations and wishes for her happiness from her friends, where she has resided a number of years and is esteemed very highly. The annual reunion of the Austin family will be held at M. J. Barnes’ Saturday, September 7. The Warters family reunion will be held at W. E. Peck’s on Wednesday, September 18. An Ice Cream social for the benefit of Rev. W.G. Hull will be given at W. E. Peck’s on Wednesday evening August 14. The reunion of Co. G 45th Regiment will be held at W. E. Peck’s on Wednesday, Sept. 18. Miss Rena Ripley is home from Elmira. Howard and Leon Webster, of Upper Lambs Creek, have been suffering with measles. The ice cream social held at W. E. Peck last Wednesday evening for the benefit of Rev. W. G. Hull, was a social and financial success. Fred C. Deuel, of Mitchell’s Creek, visited here recently. Mr. A. S. Hotchkiss, of Watkins, has gone to the Pan American. The second annual reunion of all the former students of the Lambs Creek school, was held in the school house on Friday, August 16, and it was largely attended. At 2 o’clock an elaborate dinner was served on the school grounds to which all did ample justice. It was a fine day and a very enjoyable time was had. Officers were elected as follows: President, Edward Fuller; vice president, Mrs. Eugene Day; secretary treasurer, Mrs J. C. Jenkins. The reunion next year will be held in the school house and the time was permanently fixed as the third Thursday in August. 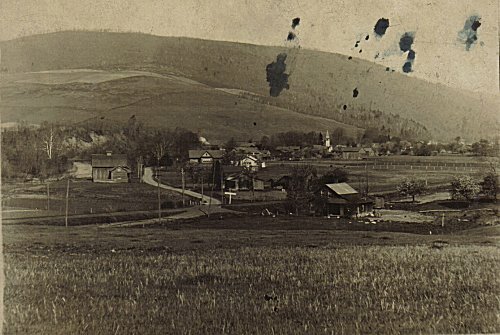 Those present from a distance were W. E. Fralic and family and Walter, George and Harry Fralic, of Corning; Mrs A. S. Hotchkiss, of Watkins; Mrs Boyd McConahy, of Willard State Hospital; Miss Josephine Griffin, of Elmira: Miss Nina Griffin, of Lawrenceville, and Colin Clark, of Galeton. Lambs Creek - Sept. 6 O. A. VanDusen of Farmington, was here last Monday. Miss Davis Clark is attending Mansfield Normal. Prof. N. C. Gile and his family started last week for VanEtten, N.Y., where he is principal of the high school. B. D. Rice, of Elbridge visited here recently. Eugene Day has purchased a horse of George Allis, of upper Lambs Creek..
S.L. Hotchkiss has put a new sheet steel roof on his house. Frank Rarick has moved his family her from Painter Run. A son was born to Curtis Reed and wife on Sept 1. Miss Rosamond Clark and Ray Clark, of Knoxville, have been visiting their brother, Horton E. Clark. Prof E.P. Shaw left last Thursday for Westover, Clearfield County, where he has a position as principal of the high school. James Morse, of Montgomery, Ill., is the guest of his sister, Mrs. Jenny Day. Our school opened last Monday with Edna ay as teacher. Elmer E. Ripley, of Trenton, N. J., is expected here soon with his wife on a visit to his parents, C. J. Ripley and wife. Miss Bessie Carter is visiting her sister, Mrs. H. G. Nolfrom, at Corning N. Y.
C. J Kelley has returned from Oswego, N. Y.
Thu VanNess spent Thursday in Wellsboro. The fourth annual reunion of the Austin family was held on Saturday, September 7, at the home of M. J. Barnes, near this place. There were seventy-five persons present and the day was happily spent. A very interesting literary and musical program was finely rendered and an excellent address was made by Rev. W. G. Hull. The weather was all that could be desired. The table was spread out of doors and each did full justice to a sumptuous repast. The following officers were elected for the coming year: President, J. Austin; vice -president, Edward Fuller; treasurer, Mrs. W. J. Cruttenden; secretary, Mrs. L. C. Lamb. The next reunion will be held at the old Austin Homestead in Ogdensburg. Mr and Mrs. Warren Moore, of Elmira, are visiting relatives here. Mrs. G. W. Paris is spending a few days in Elmira. Harry Fralic, of corning, is visiting here. L.C. Lamb is home from Corning. Miss Frances Rice, of Galeton, has been visiting her sister, Mrs. A. Warters. Mr. And Mrs. M. H. Fralic, of Corning, were recent visitors here. A donation party was given at the home of Edwin Fuller for the benefit of Rev. W. G. Hull Friday Evening. Over $19 was realized. George Fralic, of Corning, formerly of Lambs Creek, has gone to West Virginia where he has scored a good position. The annual reunion of surviving members of Company g,45th Regt., was held on Wednesday, Sept.18th, at the home of N. E. Peck below Lambs Creek. There was a large attendance of visiting comrade and others. A tent had been pitched on the lawn and under it three large tables were spread and a bountiful repast was served. After the feast the company gathered outdoors to listen to a program which was highly appreciated by all present. It consisted of reading letters from the absent members of the company, recitations and songs and a very interesting address by Rev. W. G. Hull. Officers were elected as follows; President Nelson Whitney; Vice president, T. J. Davies; Secretary, Eugene Beauge; Treasurer, L. W. Thompson. The reunion was most successful and a pleasant time was enjoyed by all. Fred Knapp, of Elmira and Miss Delia Chappell, of Daggett, were married recently. Mr. And Mrs. George Kettle, of Corning, are rejoicing at the birth of a daughter. Mrs Kettyle was formerly Miss Gertrude Noitwick..
C.J. Moore, of Corning, has been visiting his parents, J.L. Moore and wife. Casper Rarick is confined to th house with measles. Miss Rena Ripley has gone to a Brooklyn hospital to prepare herself to become a professional nurse. Miss Mae Barnes is on the sick list. M. H. Fralic and son George , of Corning, have been spending a few days here. The ladies’ aid society of the Methodist Church met last Wednesday at Mrs E. L. Fullers. Their next meeting will be at Walter White’s, on Wednesday, November 6. Alec Buck and wife of Lindley, were Sunday guests of Mrs. Jenny Day. The Methodist quarterly meeting was held here last Sunday. Presiding Elder Hubbell was present. George Ripley has returned from San Fransico. Elmer Ripley and his wife, of Trenton, N. J., have been visiting his parents, Mr. And Mrs. C. J. Ripley. Mrs. Ada M. Johnson and her two children returned last week from a visit in Galeton. C. E. Brewster and family , of Lowman, N. Y. Visited relatives in this place several days last week. Miss Edith A. Lounsberry, of the Mansfield Normal faculty, was a recent guest of Mrs. P. N. Tuttle. Mrs Mary Knowlton is visiting in Elmira. Miss Isabel Brennan, of Lindley, has been visiting her sister, Mrs. Walter White. Stephen Warters has moved into the W. H. Clark house lately vacated by Anna M. Day. Mrs Day has moved into her own house near the post office. The Methodist Ladies’ Aid Society meets at Charles Cruttendun’s on Wednesday, Nov 20. Frank Rarick moved to Tioga last week. Reuben Warters, of Upper Lambs Creek has had his house painted. Miss Edna Day attended the teacher’s institute at Wellsboro last week. It is rumored that Willard Fralic will move his family here from Corning next spring. Mrs Willard Warters and Mrs. Elmer E. Warters are visiting Wilkesbarre. J. C. Beach, of Sabinsville, was here last Tuesday. A daughter was born to Mr. And Mrs. John Day, of Round Top. Adelbert Allis, of Willard State Hospital, is visiting his parents George Allis and wife. Jefferson Brewster, of Andover, N.Y., has been visiting his sister, Mrs S. D. Brewster. Prayer meetings are held Wednesday evening instead of Thursday evening in the Methodist Church. Fred Day is home from Elmira. P. F. Ripley, of Newark N.J., is spending a few days with his parents, C.J. Ripley and his wife. Mrs. J. M. Rice and daughter, of Galeton, are visiting here. Mr. And Mrs. Eugene Day and Mr. And Mrs. William Matteson went to Round Top on Monday to attend the funeral of Mrs. John Day. Mrs. Teresa Cockran, of New York, is visiting relatives here. M. H. Fralic, of Corning, is in town this week. The sportsmen of Lambs Creek, propose to have a general hunt on Wednesday, Nov.27, with Thu VanNess and Alfred Warters as captains. An oyster supper will be held at the home of W. E. Peck on Thursday evening, the losers paying for the suppers of the winning side. The annual Thanksgiving hunt with Thu VanNess and Alfred Warters as captains, took place as scheduled. Forty-two were on a side. In connection with the affair an oyster supper was given at N. E. Peck’s, the loser’s paying for the supper of those on the winning side. About 100 people were present and a pleasant time was enjoyed by all. H.E. Clark, the Lambs Creek cheese maker, with his wife, has returned to Knoxville to winter. Mr. Clark is a successful cheese maker and had given good satisfaction. It is understood that he will make cheese here next season. The teachers and pupils of the Lambs Creek school are preparing for an entertainment and Christmas tree on Christmas Eve, in the school house. N. W. Becraft has moved into the Lydia Rarick house near the depot. Recent visitors included Walter Fralic, of Elmira; George Fralic, of Corning, Mrs. A. M. Fuller, of Morris Run; Mrs. J. L. Cooper, of Corning; Miss May Lamb, of Corning, and Clark Peck, of Wellsburg. Mrs. N.F. Peck is on the sick list. Miss Edna Day has a new piano. Mrs. L. K. Gile entertained the Baptist Aid Society last Wednesday. George Paris, of Upper Lambs Creek was accidentally shot in the arm by his brother Delbert, while hunting last Wednesday. The Methodist Aid Society will be entertained by Mrs. Sherman Warters on Thursday. Mr. And Mrs. D. B. Lamb visited in Slate Run last week. M. H. Fralic, of Corning, was here last week. Mr. And Mrs. Boyd McConahy, of Willard State Hospital, are expected here soon for a visit. The funeral of Henry Gridley was held in Canton, N. Y., last Thursday. He was the cousin of Mrs. M. J. Barnes of this place. A bucket of water was dashed over him, but the flames had done their fatal work. He was burned so badly that he died within 24 hours. Dr. Edith Flower, of Mansfield was hastily summoned and did all in her power to alleviate the little fellow’s sufferings. The flesh of one arm was literally roasted and the upper part of his body and head horribly burned. In attempt to tear the burning clothing from the child his mother was badly burned about her hands. It is not known just how the accident occurred, but it is thought the child had lighted a piece of paper that he was playing with near the stove while his mother was out of doors and his clothing caught from that. The marriage of Warren G. Russell, formerly of Tioga, and Mrs Ada M. Johnson, of this place, was solemnized at Lindley, N.Y., on December 24th. Rev. Charles Jenkins officiating. The couple left immediately after the ceremony for a short wedding trip. The bride is a very estimable young woman, and Mr. Russell is an enterprising young business man who has been employed for some time as solicitor and collector for the Tioga Argus. The best wishes and congratulations of a large circle of friends are theirs. They will reside n Lawrenceville. Miss Lena warters, organist n the Baptist services here, received from the Ladies Aid Society a handsome gold bracelet and brooch as Christmas gifts. The marriage of Fred Thompson of Blossburg, and Miss Alice Hagar, formerly of Canoe Camp, was solemnized recently. Pearl and Glen Jenkins have been quite ill with diphtheria. Ernest Boyce, of Mansfield, and Miss Lora Warters, daughter of Mr..and Mrs. Elmer E. Warters, of Upper Lambs Creek, were married in Lawrenceville on December 26th. Many friends tender them hearty congratulations. Mrs. L. C. Lamb entertained the Methodist Ladies’ Society Thursday. Mrs. S.L. Hotchkiss and daughter Mattie are visiting Tioga Friends. M. J. Barnes has returned from Trout Run. Mrs. A. S. Hotchkiss, of Watkins, has spending a week with her parents Mr. And Mrs. G. R. Fuller. I. M. VanDyne had the misfortune to fall and break his collar bone recently. Miss Gertrude Swan, of Mansfield, visited her friend, Miss Carrie Moore, one day last week. Charley Davis, of Jamestown, N. Y., has been visiting his parents Frank Davis and wife. Principal N.C. Gile, of VanEtten, N.Y. with his family, is visiting relatives here. John Peck is having a run of typhoid fever. The Methodist Quarterly meeting will be held here to-day. Presiding Elder Hubbell will be present. M.H. Fralic, of Corning, was called to Philadelphia last week by the illness of his son Harry, who has been attending the Medico-Chirurigical Medical School. S. L. Hotchkiss spent Saturday in Tioga. Mrs. A. P. Brewster and Miss Maria Lamb, are visiting in Corning. The Baptist Aid Society met at Mrs. W. F. Lamb last Wednesday. Mrs. G. R. Fuller entertained the Methodist Ladies Society Thursday. W. E. Fralic , of Corning, was here one day last week. Miss Lena VanNess, of Mansfield, visited here recently. Rev. J. A. Brown expects to begin revival meetings here soon. Mrs. C. F. White, of Elkland, is visiting relatives here. Wedding bells are soon to ring. John Peck continues to be very ill.
John Peck aged 21, son of Mr. and Mrs. W. E. Peck, died of typhoid fever on Friday morning, the 24thinst., at 6:30 o’clock, after an illness of about four weeks. Besides his parents he is survived by two brothers and two sisters, Clark, of Wellsburg; Elmer E., of Mansfield, and Lucy J. And Alta L., of this place. The deceased was an exemplary young man. He was kind hearted and industrious and his early death is sincerely mourned by a large circle of friends and acquaintances. Largely attended funeral services, conducted by Rev. Mr. Hudson, of Painter Run, were held from the home of Mr. Peck’s parents on Sunday. The remains were taken to Charleston for burial. The family have the sympathy of the entire community. Frank, son of Walter White, is very sick with pneumonia. A happy wedding was solemnized last Sunday at the home of the bride’s parents of Upper Lambs Creek, when Joseph Oyer, of Alden, Ill., and Miss Estella Warters were united for life. Rev. W. H. Latimer officiated. The ceremony was performed in the presence of a few relatives of the principals. Both young people are highly esteemed and have hosts of friends who extend hearty congratulations. Mrs. W. G. Russell and son Clinton, of Lawrenceville, have been spending a few days here. Harry Fralic, of Corning, has undergone a surgical operation for appendicitis in Philadelphia, where he has been attending the Medico-Chirurgical Medical School, is reported as steadily improving. W.G. Seaman, of Mansfield, rejoice over the birth of a daughter. Mrs. Anna M. Day is spending a few days in Corning. A daughter was born to Mr. And Mrs. W. H. Kelley on January 18. The Methodist aid society met with Mrs. W. H. Clark Thursday, a large number being present. Mrs W. L. Cochran has gone to New York. Mrs. J. L. Moore has returned from a visit in Corning. Justice George R. Fuller is improving. Eugene Bailey has been repairing Fralic’s mill here. He has the contract for sawing several thousand feet of logs for Mr. Fralic the coming spring. Mr. And Mrs. F. W. Davis visited friends in Covington recently. Mrs. Thu VanNess, who has been in Elmira for treatment for the past four months, has returned to her home in Mansfield in much improved health. Miss Maria Lamb returned home last Wednesday from Corning. Mrs. C.J. Ripley has been suffering with the grip. Herbert Hagar, of Upper Lambs Creek, has been very sick, but is reported much improved. T. G. Hagar, of Corning, was here recently. The Baptist Aid Society met with Mrs. J. M. Marsh last Thursday. N. B. Lamb, of Corning, has been visiting his parents, D. B. Lamb and wife. Mr. and Mrs. J. Tanner, of Mainesburg, visited friends here last week. Mrs H. Glenwright entertained the Methodist Aid Society Thursday. There was a good attendance. Mrs. Charley Kingsley, of Mansfield, was a recent guest of Mrs. Anna M. Day. W. E. Fralic, of Corning, has moved onto the M.H. Fralic farm occupied by Sherman Warters. Mr Warters has leased the J. B. Clark farm near Canoe Camp and he expects to move there soon. J. C. Jenkins and family have moved to Covington. William Walker, of Mansfield occupies the house vacated by Mr Jenkins. The Methodist Ladies’ Aid Society met at Mrs. M. J. Barnes today. Mrs. Lydia Clark, of Mansfield, visited at Mrs. D. B. Lamb’s a few days ago. W.G. Russell, of Lawrenceville, was here last week. Mrs. Hubert Hagar, who has been very sick with typhoid fever, is improving. Mrs. C. F. White has returned to Elkland. A son was born to Mr. And Mrs. Harry Loveless, of Mill Creek. Our school is prospering finely with Miss Edna Day as teacher. Mrs. W. L. Cruttenden and her son Howard, of Mansfield, visited here recently. Relatives and friends of Sherman Warters and wife tendered them a surprise party last Thursday evening, about 45 persons being present. A very nice supper was served and a pleasant time enjoyed by all. The guests presented Mr. and Mrs. Warters with a handsome rocker. Bertha and Clark Brewster, of Lowman, N.Y., are visiting their grandparents, Mr. And Mrs. L. K. Gile. Mrs. W. B. Ripley, of Upper Lambs Creek, has bought a house and 21 acres of land near Jackson for $1,300. She expects to occupy the place by April 1. A son was born t the wife of I. M. VanDyne on March 23rd. The dyking work on this side of the Tioga River near S. L. Hotchkiss residence is nearly completed. James Rarick, of Upper Lambs Creek, has moved to the Schusler farm south of Canoe Camp; Joseph E. Oyer to the Sidney Woodward farm on Mill Creek; Frank Knights and family have moved to a farm near Nelson; George Oldroyd, of Mann Creek, will occupy the house vacated by Mr. Knight. H. B. Knapp and wife of Upper Lambs Creek, rejoice at the birth of a daughter. Miss Maud Matteson, aged 17, daughter of Mr. and Mrs. William Matteson, of Upper Lambs Creek, died on March 30th, of Peritonitis, after being ill only about a week. Besides her parents she is survived by a brother. She possessed a kind and loving disposition and was much esteemed by all who knew her and her early death is sincerely mourned by many friends. Very largely attended funeral services conducted by Rev. N. H. Latimer, of Mansfield were held here from the Methodist Church at 2 p. m., Tuesday. Beautiful and appropriate music was rendered by a quartet from Mansfield. The remains were taken to Mansfield for burial, accompanied by a large number of friends of the deceased. Prof. E. P. Shaw’s many friends here were pleasantly surprised Saturday when he arrived, bringing a bride with him. He is a very popular young man, who for the past two years has been the principal of the graded school at Westborder, Clearfield County. Many friends extend congratulations. Mrs. N. B. Ripley has sold her dwelling here near F. Flower’s store for $300to Edwin Paris. Eugene Day has moved onto the M.H. Dorsett farm on Upper Lambs Creek, formerly occupied by G. N. Matteson, Mr. Matteson has moved into the Ripley house, which Edwin Paris bought recently. A daughter was born on the 11th instant to Mr. And Mrs. H. B. Rice. The recent warm sugar social at A. Jenkins’ netted Rev. J. A. Brown about $12. An enjoyable time is reported. C.E. Brewster is enlarging and otherwise improving his residence. Alec Buck and wife, of Lindley, have been visiting friends here. The portable saw mill of Dayton & Warters and Mrs. Day’s large barn narrowly escaped burning last week. The fire started in a fence near the barn from a flying spark from an engine and had gained considerable headway before it was discovered, but it was extinguished before any serious damage was done, although, a strong breeze was blowing at the time. Mrs. J. L. Moore, dislocated one of her wrists recently. The Methodist ladies cleared $6.50 from their supper Thursday evening. Mrs. W.G. Mann and Master Norman Ware, of Elmira, are visiting here. The Baptist Aid Society met with Mrs. Wilson Day last Thursday. P.N. Tuttle had business in Elmira last Monday. A daughter was born to Mr. And Mrs. H. C. Jones on April 29th. Elmer E. Ripley and wife of Trenton, N. J. Were recent visitors here. At the regular meeting of the Methodist Ladies’ Aid Society last Thursday, at Mrs. N. E. Fralic’s the following officers were elected for the upcoming year: President, Mrs. E. B. Fuller; Vice-president, Mrs. G. R. Fuller; Secretary, Carrie Moore; Treasurer, Mrs. N. A. White. William Sweet and wife, of Corning, are visiting the latter’s parents, J. L. Moore and wife. Mrs. Nelson Day, of Upper Lambs Creek, is slowly recovering from a serious illness. Wm. J. Cruttenden has been painting his residence, which greatly adds to its appearance. Harry B. Fralic, of Corning, formerly of this place, who ha been attending the Medico-Chirurgical Medical School in Philadelphia, is here to spend part of his vacation with his brother, Willard E. Fralic. The Methodist Ladies’ Aid Society meets at Mrs. Henry Warters on Thursday, May 22. Walter Cruttenden and his wife, of Wilkesbarre, are visiting his parents Mr. And Mrs. Nelson Cruttenden, at Upper Lambs Creek. Miss Mae Barnes returned last Wednesday from a week’s visit at Galeton. The Ladies’ Aid Society of Methodist Church are preparing to paper and otherwise improve the interior of the Church. Mrs. Anna Day and daughter, Bessie, have returned from Corning accompanied by Mrs. H.G. Wolfrom and daughter, Edna. F. E. Scofield and wife, of Corning, rejoice over the birth of a son..
Mrs. Elmer E. Warters, of Upper Lambs Creek is seriously ill.
Miss Mary Ingalls, of Upper Lambs Creek, is spending a few weeks in Elmira. Miss Josephine Griffin, of Elmira, is visiting her parents..
Stephen Warters, of Kelleytown, is building a fine dwelling house. The cheese factory here commenced operations Monday morning with Ross Sigsbee, of Sylvania, as manager. The Baptist aid Society will be entertained by Mrs. Anna Day on Thursday, May 29. Mrs. Elmer Warters, of Upper Lambs Creek, is recovering from a serious sickness. Following are the officers of a literary society recently organized at Mann Creek: President, Philip J. Lent; Secretary, Miss Carrie Moore; Treasurer, William Spencer; Librarian, Miss Mamie Oldroyd. Benjamin Nelson spent Sunday with Ross Sigsbee, of this place. Boyd McConahy and his wife, of the Willard State Hospital, are visiting the latter’s parents Mr. And Mrs. Abner Jenkins. J.L. Cooper, of Corning, w3as her on Thursday. A phone has been set up at Willard E. Fralic’s. Miss Pearl Jenkins has returned from a two weeks’ visit in Covington. There will be prayer meeting in the school house every Friday evening until further notice. Mrs Emma Day, of Graceton, with her son, is visiting at the home of G. H. Matteson. Miss Bertha Brewster has gone to Slate Run to visit her aunt, Mrs. Frank Travers. Ernest Cruttenden, of Hazelton, Luzerne County, was here recently. Aldelbert Allis, of Willard State Hospital, New York, is visiting his parents. Mrs. And Mrs. George Allis. J. F. Ripley, of Harrisburg, is spending a few days here. Miss Jennie L. Rice, a trained nurse in State Hospital at Utica, N.Y., is expected here soon on a visit to her sister, and Mrs. E. L. Forest, and other relatives. C.F. White and wife, of Elkland, are visiting here. Mrs. Charley Cruttenden is visiting in Elbridge. Alfred Willard, of Wellsboro, and Miss Mary Clark, were married at Lyons, N.Y., June18, Rev. W. G. Hull, formerly pastor of the Methodist Church at Mansfield, officiating. The congratulations of their many friends are extended heartily. A number from here went to Elmira on th excursion Saturday. Mr. and Mrs. W.F. Lamb entertained company from Tioga last week. Miss Edna Day has been engaged to teach our school and Miss Lulu Kohler, of Mardin, to teach the Dorsett school at Upper Lambs Creek. Recent visitors here included Mrs. Anna Fralic, of Corning,; P. F. Ripley and family of Newark, N. J.; Miss Rena Ripley, of Brooklyn; Mrs. E. B. Dorsett, of Wellsboro; and Miss Anna Marsh, of Marshlands. Mrs Abner Jenkins, of this place, received a sprained ankle one day recently, caused by jumping from a buggy. The ladies of the Methodist Church will serve ice cream and cake at the church Friday afternoon and evening, July 4. A cordial invitation to everyone. A son was born on the 22nd inst. To Mr. And Mrs. Elmer E. Peck. Mrs. W.G. Mann and Mrs. George C. Ware and children of Elmira, are guests of their parents, O. Angell and wife. Mrs. L. C. Lamb is spending a week with Corning friends. Elmer E. Warters is sick. The thanks of the Advertiser are due Mr. Frank Leonard, of Grover; Miss Ella Rankin, of Lambs Creek; Mrs Arthur Dickinson, of Blossburg; Rev. A. D. Ayres, of Canton; Mr. W.D. Narsh, Blossburg, for copies of the issue of the Advertiser for October 4th, 1901. No more are needed, as our files are now complete.